Powered by M12 REDLITHIUM Battery Technology, Milwaukee<sup></sup> M12 Heated Jackets use carbon fibre heating elements to create and distribute heat to the chest, back, and front hand pockets. For use in abrasive environments, ToughShell Stretch Polyester delivers 5X Longer Life than previous softshell jackets, and provides wind and water resistance to survive the elements. Powered by the revolutionary M12 REDLITHIUM battery, the M12 Cordless LITHIUM-ION Realtree AP Camo Premium Heated Jacket delivers comfort and heat in cold weather conditions. This jacket utilizes new cold weather technology to actively warm the body and stimulate blood circulation. Three carbon fiber heating zones distribute heat to core body areas, with a stylish performance-fit that gives users maximum flexibility and comfort during use. The 2342 M12 Red Premium Heated Jacket features three heat settings for varying heat needs, and is water and wind resistant for a variety of weather conditions. Available in sizes ranging from S - 3XL. Battery and charger not included. The large Realtree camo heated QUIETSHELL jacket kit is powered by the M12 REDLITHIUM battery. Each heated jacket uses carbon fiber heating elements to create and distribute heat to the chest, back and front hand pockets. A single touch LED controller heats up the battery heated jacket to three heat settings. The MILWAUKEE heated jacket kit's Quick-Heat funtion heats up three times faster than previous jackets and market competitors. The heated hunting jacket also features Realtree Edge camo pattern. The QUIETSHELL stretch polyester material reduces noise from movement and provides wind and water resistance. This kit comes with one heated jacket, an M12 battery and compact charger and power source. 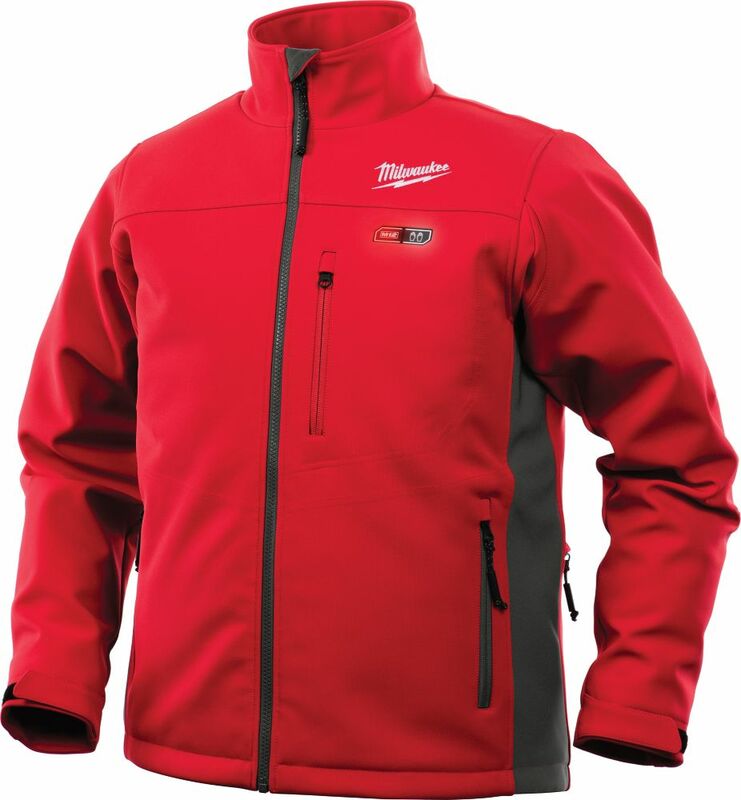 M12 Heated Jacket Only - Red/Gray - Medium Powered by M12 REDLITHIUM Battery Technology, Milwaukee<sup></sup> M12 Heated Jackets use carbon fibre heating elements to create and distribute heat to the chest, back, and front hand pockets. For use in abrasive environments, ToughShell Stretch Polyester delivers 5X Longer Life than previous softshell jackets, and provides wind and water resistance to survive the elements. M12 Heated Jacket Only - Red/Gray - Medium is rated 3.0 out of 5 by 2. Rated 5 out of 5 by Greatcoat from Bought forward my son he works as plumber I... Bought forward my son he works as plumber I am lot of buildings without enough heat loved the jacket, and it was recommended by coworker the Medium fit good, he is 5 11 and thin.